Golden Lines Instructions: Return to the chapter 14-18 and locate a “golden line” you found most compelling (interesting). 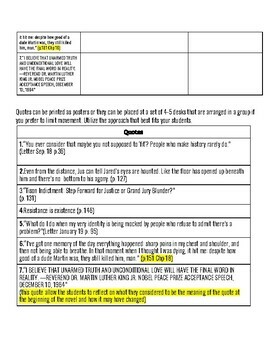 Add the direct line from the text and explain the meaning. Quote Analysis Instructions: The quotes allow the reader to follow Justyce on his journey of conflict with identity and existing in a world that seemed to be against him. Following the death of Manny, the weight of the world becomes more uncertain. Conduct a silent walk to each of the quotation stations while reading and internalizing the troubling events in the novel. 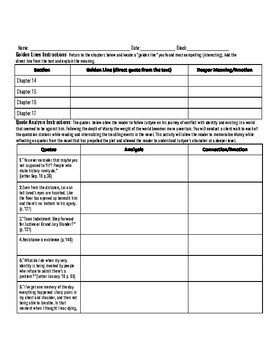 This activity will allow the reader to memorialize Manny while reflecting on quotes from the novel that has propelled the plot and allowed the reader to understand Justyce’s character at a deeper level.